Tunzamunni is a three-reel progressive video slot game designed by Microgaming, the most accomplished company in the online casino software business. This is a game with one payline and one payline only which allows a five-coin maximum bet. There is a fixed coin size of .05. Tunzamunni has no wild symbols, and has only two kinds of symbols - Sevens and Bars. They have to line up on the one designated payline to win. 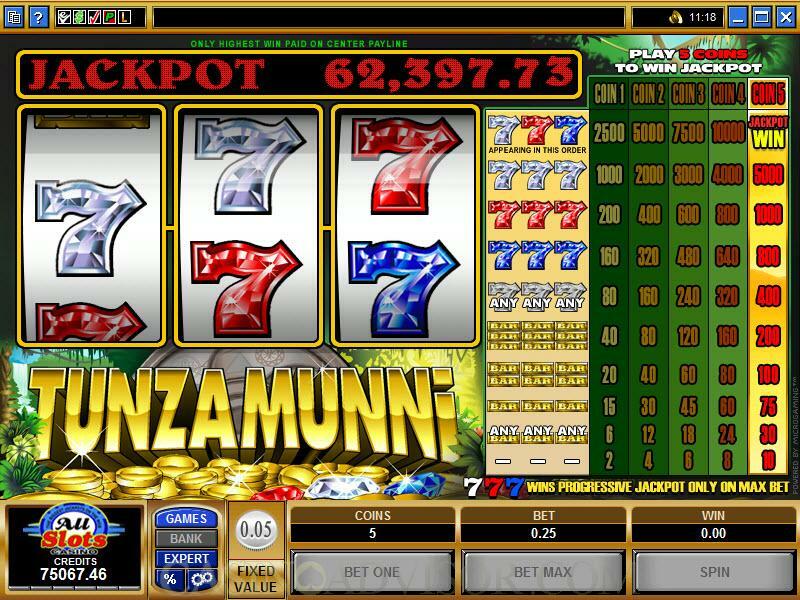 Tunzamunni, unlike a lot of slots games, does not have wild symbols or scatter symbols, and has only one payline. While this may not provide a lot of the "bells and whistles" some players appreciate, it does indeed simplifying the matter of winning and losing. Tunzamunni is a progressive slots game, which means that there is a jackpot that incrementally increases with each bet made by each player across the system, and the jackpot, when it is won, is governed by the entire pool of progressive money that has accumulated. There is also one coin size in Tunzamunni, which is 0.05. There is a five-coin limit, the maximum bet in the game is 25 units. You can go right to the maximum bet at any time - just click the "Bet Max" button at the bottom of the interface. That's critical, since a maximum bet is mandatory to qualify for the progressive jackpot, which starts at $10,000 and goes upward, so you must play five coins per round if you want to be in the running. The progressive jackpot is conquered when the you get a white, red and blue Seven (7) across the payline and have that aforementioned bet out. When a jackpot is won, everyone in the world who is participating in the game is made aware of it, and it returns to its starting figure of $10,000. Interested in reading more detailed information about Tunzamunni? If so Click Here for more details.